I had to make a few slides about blinding and decided a cartoon might be fun to make and a graphic way to display the information. As I am getting a degree in educational technology I have a proclivity to try new tools. I found an article on free cartoon making tools and decided to give one a try. It was intuitive and had reasonable features. I had initially planned to draw my own characters and put masks on them but in the interest of time just used the characters already in the program. Try using new tools when you can and the situation fits. It can be fun and interesting. Always remember that the tool you use should facilitate learning and not just be used because its cool. I felt a graphic would help learners understand blinding more that just a word description. One of the more challenging concepts for students is how to apply information from a study to an individual patient. Students have been taught how to calculate a number needed to treat (NNT) but that isn’t often very useful for the current patient they are seeing. Usually our patients are sicker or healthier than those in the study we are reading. Studies include a range of patients so the effect we see in the results is the average effect for all patients in the study. Imagine you are seeing Mr. Fick, a 70 yo M with ischemic cardiomyopathy (EF 20%) and refractory anemia (baseline Hg 7-10 mg/dl). He reports stable CHF symptoms of dyspnea walking around the house after about 30 ft. He reports other signs and symptoms of CHF are stable. Medications include lisinopril 20mg bid, aspirin daily, furosemide 80 mg daily, and iron tablets daily. He is not taking a beta blocker due to bradycardia and can’t take a statin due to myopathy. He has refused an ICD in the past. BP is 95/62 mm Hg, pulse is 50 bpm, weight is stable at 200 lbs. Labs done one week earlier show a stable Na 0f 125 mmol/l, K 3.8 mmol/l, Hg 8 g/dl, platelets 162 k, WBC is normal with 22% lymphs on differential, cholesterol is 220 mg/dl, and uric acid is 6.2. Since he has severe CHF you are considering adding spironolactone to his regimen. he is concerned because he has a hard time tolerating medications. He wants to know how much it will help him. What do you tell him? This figure is from the RALES trial, a study of spironolactone in patients with advanced CHF. Use the figure below to figure out Mr. Fick’s individual estimated risk of death if he agrees to take spironolactone. There are 4 methods I will demonstrate to calculate a patient-specific estimate of effect from an RCT. First, think about what information you will need to estimate Mr. Fick’s specific benefits of spironolactone. You will need the NNT from the RALES trial and Mr. Fick’s estimated risk of death (we call this the PEER or the patient expected event rate). Where do we get the PEER of death for Mr. Fick? You use a validated prediction rule. I use Calculate by QxMD. Look in the Cardiology folder under heart failure and open the Seattle Heart Failure Model. Plug in Mr. Fick’s data and you get his 1 year expected risk of death (56%). Method 1: Calculate patient-specific NNT using PEER: the formula for this is 1 / (PEER x RRR) where RRR is the relative risk reduction from the RALES trial (30%. To calculate that: 1-RR is the RRR). So plugging that in, Mr. Fick’s NNT is 1 / (0.56 x 0.3) = 6 (the NNT from the RALES trial is 9). Method 2: Estimate patient-specific NNT using f: F is what I call the fudge factor. It is your guesstimation of how much higher or lower Mr. Fick’s risk of death is than that of the average patient in the study. If you say he is 2 times more likely to die then f is 2. If you think he is half as likely then f is 0.5. The way to use f is to divide the study NNT by f. This gives an estimate of Mr. Fick’s NNT. So lets just say Mr. Fick is twice as likely to die than those in the study. The NNT of the study is 9. So 9/2 is 4.5 which I would round up to 5. NNTs are nice but its hard to use them directly with a patient. The next 2 calculations are more useful for patients. Method 3: use the RR to calculate Mr. Fick’s actual risk of death: the RR of death in the RALES trial is 0.70. You multiply this by his estimated death rate and you get his expected death risk if he were on spironolactone instead of nothing. His risk of death is 56%. So 0.70 x 0.56 = 39%. 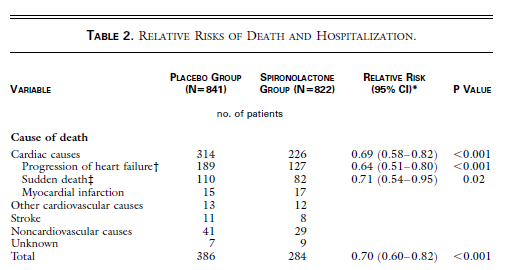 So if Mr. Fick takes spironolactone I expect his risk of death to go from 56% down to 39%. That’s useful information to tell the patient. Method 4: use the RRR to calculate Mr. Fick’s actual risk of death: This is similar to the concept above except that you have to remember that the RRR (relative risk reduction) is relative. So first you calculate how much risk is reduced by the treatment. The RRR is 30% (1-RR is RRR). Then I multiply this by the patient’s risk of death. 0.30 x 0.56 is 0.168. This 16.8% represents how much risk I have removed from the baseline risk. Now I have to subtract it from the baseline risk and I get his final risk. So 0.56-0.168=0.39 or 39%. Same number as method 3 and it has to give the same number because its just a different way of calculating the exact same thing. I hope this is useful and now you can give patients some real numbers instead of just saying your risk is decreased by x%. Remember you need: patients risk of the event without treatment (usually from a prediction rule or maybe the placebo event rate of the study or placebo rate of a subgroup) and event rates from the study. Then you can make all the calculations from there. During journal clubs on randomized controlled trials there is often confusion about allocation concealment. It is often confused with blinding. In a sense it is blinding but not in the traditional sense of blinding. One way to think of allocation concealment is blinding of the randomization schedule or scheme. Allocation concealment hides the randomization or allocation sequence (what’s coming next) from patients and those who would enroll patients in a study. Blinding occurs after randomization and keeps patients, providers, researchers, etc from knowing which arm of the study the patient is in (i.e. what treatment they are getting). Why is allocation concealment important in a randomized controlled trial? Inadequate or unclear allocation concealment can lead to an overestimation (by up to 40%!) of treatment effect (JAMA 1995;273:408). First, consider why we randomize in the first place. We randomize to try to equally distribute confounding and prognostic factors between arms of a study so we can try to isolate the effect of the intervention. Consider a physician who wants to enroll a patient in a study and wants to make sure her patient receives the therapy she deems likely most effective. What if she figured out the randomization scheme and knows what therapy the next patient will be assigned to? Hopefully you can see that this physician could undermine the benefits of randomization if she preferentially funnels sicker (or healthier) patients into one arm of the study. There could be an imbalance in baseline characteristics. It could also lead to patients who are enrolled in the study being fundamentally different or not representative of the patient population. – sequentially numbered, opaque, sealed envelopes: these are not able to be seen through even if held up to a light. They are sealed so that you can’t peek into them and see what the assignment is. As each patient is enrolled you use the next numbered envelope. – pharmacy controlled: enrolling physician calls the pharmacy and they enroll the patient and assign therapy. – centralized randomization: probably the most commonly used. The enrolling physician calls a central research site and the central site assigns the patient to therapy. Proper randomization is crucial to a therapy study and concealed allocation is crucial to randomization. I hope this post helps readers of RCTs better understand what concealed allocation is and learn how to detect whether it was done adequately or not. Keep in mind if allocation concealment is unclear or done poorly the effect you see in the study needs to be tempered and possible cut by 40%.